Bowie’s movie career had started with his best film, so it had nowhere to go but down. His second feature, Just a Gigolo (the official title was the German: Schöner Gigolo, Armer Gigolo), was the sort of wrack left at the ebb of an era, one of those bloated ’60s and ’70s film extravaganzas that sunk a small fortune on locations and sets and bribed as many aging stars as possible to fill the cast list. These films were like James Bond movies without the gadgets or the wit. In this case, Gigolo was meant to be the grand return of German film, boasting the largest budget ($19 million, inflation-adjusted) since the war. 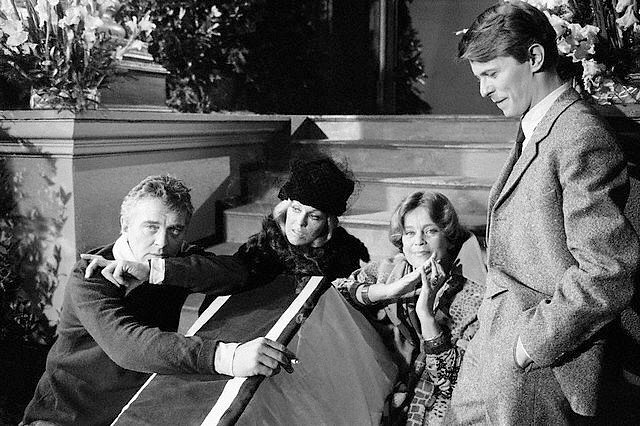 You’d expect an aging Hollywood director or a rising vulgarian like Dino de Laurentiis to be behind something like Gigolo, but the film was the vanity project of the British actor David Hemmings (best known for Blowup). He wooed Bowie for the lead role by noting that Gigolo would be shot in Berlin, making it convenient for Bowie, and by assembling a collection of legendary actresses for him to play against, including Kim Novak and (the clincher for Bowie) Marlene Dietrich. But the reclusive Dietrich refused to come to Berlin, so Bowie’s scene with her was shot in two parts—Dietrich alone on a Paris soundstage, Bowie acting “to a chair” in Berlin, as he recalled. Gigolo was a disaster upon release, getting vicious reviews and poor box office, with Hemmings repeatedly re-cutting the film in a bid to salvage it until it was taken away from him and dumped into theaters in a butchered, barely-coherent cut. Worth a viewing (most of it’s in fragments on Youtube) if you’ve some time, as Bowie is like Jayne Mansfield in The Girl Can’t Help It—the beautiful, oblivious object of desire for the rest of the cast. He also hasn’t shaken the image of being an extraterrestrial in disguise, which gives the film a slight SF quality; it’s as if an alien had posed as a gigolo in Weimar Berlin. As Hemmings had a rock star in his film, he naturally wanted something on the soundtrack from him. Bowie’s effort was the paltriest thing he recorded in the ’70s: “Revolutionary Song,” a Brecht/Weill pastiche co-written with Jack Fishman. I think Nicholas Pegg’s speculation is correct that Fishman essentially tarted up a doodle that Bowie played during filming. Bowie’s sole contribution was the “la-la-la-la-la-la-la-LA-la-la” vocal melody, which sounds as if they taped it while Bowie was singing in the shower. Recorded ca. February-March 1978 (Bowie’s vocal?) and likely finished later in 1978; released on the Just a Gigolo soundtrack in June 1979 (the track was credited to “The Rebels”), and as a single in Japan. A justifiable obscurity, “Revolutionary Song” never has been released on CD or digitally. The Gigolo soundtrack features Marlene Dietrich, the Village People, David Bowie and a Scott Joplin rag: it sadly missed the cut to be included on Voyager 2 as an example of the glorious mess that is human civilization. Top: Just a Gigolo cast searching for direction, ca. January-February 1978.